The lion doesn’t sleep tonight, because there are no lions in South America. There are jaguars, but we didn’t see any. 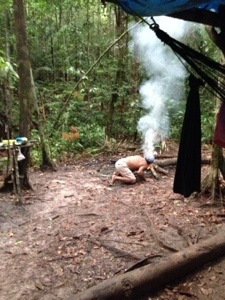 However, we did finally make it into the jungle for a couple of nights. Jungle tours throughout the region are quite similar, unless you have a specific request you will spend the first night at a lodge, the second in the jungle and if you do stay a third night that can be spent doing a homestay with indigenous people. 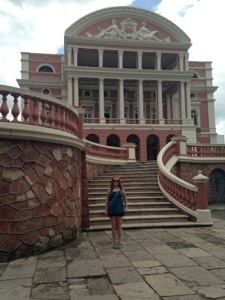 Liam and I spent a full afternoon going round various outfits in Manaus trying to choose a tour. Our thoughts on each can be found below*, but we eventually booked with Amazon Antonio Jungle Tours who had an office in our hostel. Quite surprisingly for us they were the most expensive option, but they seemed to guarantee the most hiking. After eight nights on boats, lounging around in our hammocks, we were keen to get out and about on our feet. 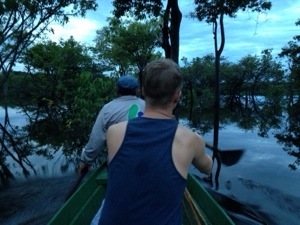 Their tour went into the black river amazon region. Our Lonely Planet told us that this would mean less wildlife, but also less mosquitos than the white rivers. Knowing our tendencies towards bites this was a trade off we were willing to make. We left the hostel, met Martin a German doctor also in our group, and took a taxi to the bus station. 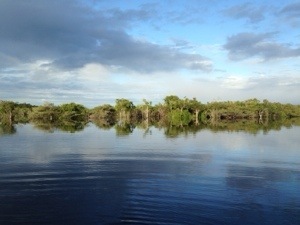 After a three hour public bus ride, were met by our guide Joseph, and finished with a boat to the lodge on the Rio Urubu. Joseph was an interesting character. To begin with I thought he hated us. Then I thought we just kept doing things wrong, Martin especially felt like that! But as our time wore on I began to realise his abruptness was more due to the language barrier than anything else. He had told us he was fairly new to guiding so maybe he didn’t really have any established “chat”. His knowledge of the plants and wildlife however was great and by the end of our time I’d venture to say he quite liked us. 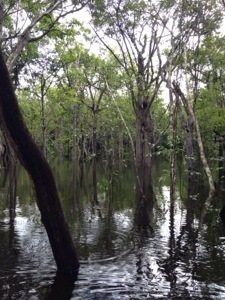 After lunch we had free time before heading out on a boat trip through the flooded forest. We were the only boat around, and it was so peaceful gliding through the trees and seeing their reflections. From the boat we saw a school of river dolphins. Liam and I had seen them from the cruise, but this seemed more intimate. We then tried our hand at piraña fishing. Martin caught one, then I did. Mine was spared because it was too small to warrant keeping. Pirañas are small, bony fish, so I guess they have to be bigger to be worth eating. Joseph caught a small catfish, but again he threw it back. We did eat the sole piraña at dinner, it was quite nice! After dinner we had another boat trip. 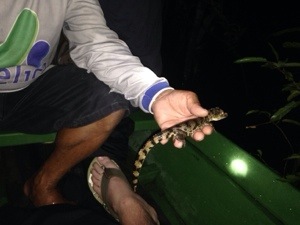 This time we were hunting cayman, which are small crocodiles. They are found by shining a torch and looking for their red eyes. We found a very small baby one, and then it peed on my coat. We also saw the eyes of some large cayman, but they are timid and quickly the eyes would be gone. Not that I was complaining, I didn’t want to meet one of those whilst we were within the flooded trees!! The second day started early. Well, we were ready at 5.00am as instructed, Joseph appeared around 5.30am and then acted like we’d kept him waiting. We went bird watching, but I think I’d had unrealistic expectations for that part of the trip. We did see a distant toucan amongst others in the early morning light. 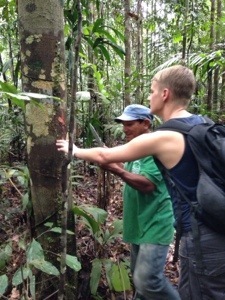 Next we finally got to stretch our legs with a hike through the rainforest. At this point I really appreciated the perks of being a small group. Even the four of us probably sounded like a herd of elephants approaching to the native wildlife. I dread to think what a group of eight sounds like! We heard some monkeys, and lots of different birds, but nothing stuck around long enough to be spotted. There were trails of animals, we even saw an aardvark den. Well the aardvark probably wasn’t there long, the wild pigs had probably already moved in to squat. The animal kingdom really isn’t that far removed from human society at times! 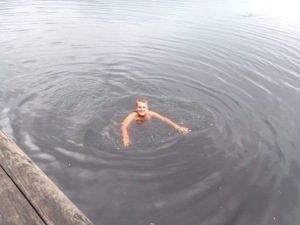 It was a sweaty escapade and we welcomed opportunity to cool off by jumping into the River Urubu back at the lodge. Martin had elected not to camp in the forest, so Liam and I headed off that afternoon with Joseph, hammocks in hand. We only walked an hour into the jungle but it felt like another world. There was a tarpaulin strung between trees and we hung our hammocks under that. After collecting firewood we started cooking dinner. It was epic. We had rice and vegetables boiling away, a roast chicken, and barbecued onion. All this eaten off bamboo leaves with spoons that Joseph had fashioned from a breo tree he’d taken resin from to use as a firelighter. It’s incredible how everything was used but nothing exploited. We’d been told by numerous others we wouldn’t sleep well in the jungle, that the noises and prospects of animals would keep us awake. I for one continued by canny knack for sleeping anywhere and slept soundly all night. Missing the rain and Joseph’s impression of a chainsaw apparently. 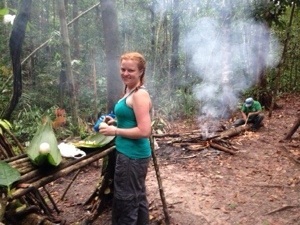 After an impressive breakfast of boiled eggs, fresh bread and coffee we headed off into the jungle again. This time, with only three, we saw some Lion Monkeys and far more birds. It was great to see and not just hear the wildlife around us. Even if some of them had names like “turkey bird” and “chicken of the jungle”, I maintain they were more impressive spots than a trip to the Asda freezer aisle. We tried also the palm fruit, tucuma. It was then back to the lodge, another dip in the river and lunch before our time in the jungle came to an end. The experience had been awesome, even if it wasn’t that unique. The trade off had also worked in our favour. Despite not using mosquito nets we’d barely picked up any new bites. Something we’d appreciate once we got to Guyana. Jungle experiences invariably make the “top recommended activities” in every South American country. Now we’d been to the “Lungs of the World”, the Amazon rainforest, we could choose whether to go again without feeling like we were missing out. We had another day in Manaus to deal with a load of life admin, to do lists coming out of our ears, and then it was off the beaten track, heading north to Guyana. This would have been my first choice had it not been that it would only have been myself and Liam in the group, and we’d have to wait another day in Manaus before we left. The guy at this company had met us on the boat. He was very pushy and tried to arrange our tour, our accommodation afterwards, our bus ticket and transfers. He’d done the same with the Austrian girls and their flights. His attitude about how he’d had “a good day” really put us off, we didn’t feel like he was overly concerned about our experience as long as his commission was healthy. The tour did sound good though, there was a group of 3-4 already going out. We spoke to an older Portuguese man at this office which was next door to Amazon Backpackers. He offered us a room for the same price as hammocks at the lodge, as long as we didn’t tell the others in our group. Some of the explanation was lost in translation but our decision not to book with them was based on what seemed like a lack of actual exercise. I’ve already said above we were keen to get out on our feet. This is a busy outfit and so have numerous groups at their lodge each day. This means that you can choose to go with a different guide if you prefer their activity. We didn’t choose them because they couldn’t guarantee that a guide would be camping in the jungle, something we knew we wanted to do. Clearly we chose this operator, they did what it said on the tin, and we were sold as soon as they mentioned three different walks. This sounds amazing, I don’t know if I would have the bottle to do the jungle trek (maybe 30-40 years ago). I assume that when you decided to cool off in the Urubu that you had checked first to make sure that the piranhas either don’t come out of the jungle, or at least not as far as you were swimming. Some of the lyrics of the song ‘On Ilkley Moor baht ‘at’ come to mind…..’Then we shall all ave etten thee’. (look it up). No lions, but jaguars….any fords or vauxhalls?